Tungsten is extremely hard to melt, so when large pieces are needed it is often sintered into solid form from loose powder, like this cube. The biggest application by far is tungsten wire for incandescent light bulbs. Scroll down to see examples of Tungsten. Larger | Spin | 3D Tremendous block of tungsten. This is a block of tungsten about the size of one of the larger Harry Potter books (hardcover). The main difference, aside from the lack of character development in the tungsten block, is that the block weighs about as much as some of the people reading the book, 84 pounds. Wow, that's a lot of tungsten! It came from a scrap metal dealer who reports that it was a collimator vane from a linear accelerator, possibly a Varian Clinac. No further information was forthcoming. Larger | Spin | 3D Golf club insert. I think you're supposed to stick this thing to the front of your golf clubs. I can't imagine how that would do anything but mess them up. Larger | Spin | 3D Experimental tungsten crucible. This is a very pure vapor-grown piece of Tungsten. It was grown for research on an internal mandrel through an unknown process, though almost certainly from tungsten hexafluoride either by hydrogen reduction or thermal decomposition. As you can see, it is long and hollow, closed on one side; I don't know for sure, but I would guess that the lab was trying to see whether tungsten crucibles could be manufactured economically that way, though I am not sure. The outer surface has clearly been lathed; only the bottom retains its porous, almost soft surface characteristic of thick-film deposited metal. In addition, the microstructure looks almost sintered; my guess is that they found it to possess similar mechanical properties but was less economical than simply sintering a similar structure, based on the time and equipment necessary for any sort of vapor growth as opposed to powder metallurgy. A very nice research sample nonetheless. Larger | Spin | 3D Beautiful tungsten cube. This is a very, very nice solid tungsten cube by Metallectric, which has a variety of elements available in cube form. Larger | Spin | 3D Tungsten carbide car weight. Small (1" square) weight made of tungsten carbide and meant to be used in Pinewood Derby (model) race cars. I'm not clear on whether that would be considered cheating or not. Larger | Spin | 3D Pure tungsten welding rod. Pure tungsten (color coded green) welding rods. Larger | Spin | 3D Beautiful tungsten carbide burr. This attractive flame-shaped grinding burr is made of solid tungsten carbide. Larger | Spin | 3D 500W bulb filament. This is a light bulb filament from a 500W photo lamp of a type we no longer use since upgrading to 85W compact fluorescent bulbs which run much cooler. Larger | Spin | 3D Attractive bulb filament. This is a particularly attractive light bulb filament. Larger | Spin | 3D High purity crystal bar. Rod of high purity tungsten. Larger | Spin | 3D Ear weights for dogs. Oh God, this is so wrong on so many levels. Let's start with some background. People breed dogs for many reasons. In the past it was mainly to create animals with useful characteristics, such as the ability to swim out to retrieve ducks, or burrow through narrow tunnels to catch moles. But then the inevitable tendency of certain people to over-organize things took hold. People started breeding dogs mainly to show them to other people. Breed "standards" started sprouting all sorts of ridiculous curlicues, like the exact shape and direction of the ears. Some dogs are supposed to have ears that hang down, others are supposed to have ears that point up, and woe unto the dog with wrong-pointing ears. And what do you do if your should-be-down-pointing dog's ears don't point down enough? You cheat of course! And that's where this product comes in. Tungsten is very heavy, so it stands to reason that if you, as recommended by the instructions, apply some sticky wax to the inside of your dog's ears and then sprinkle this powder on, the weight will pull the poor mutt's ears down, making you more likely to win a ribbon at the local dog show run by judges who aren't up on the latest dog show cheating technology. Technology in service to cheating at things that deeply don't matter! What will they think of next? Well, I'm sure if they ever invent anti-gravity powder it will be sold for use on should-be-up-pointing dogs. Larger | Spin | 3D Raw tungsten carbide pellet. This is a pellet of sintered tungsten carbide (with cobalt as the binder). I made it myself using a graphite mold (listed under carbon) and an acetylene torch. Check out the neighboring sample to see what I did with it. You can read more in my Popular Science column on the topic. Larger | Spin | 3D Home made tungsten carbide lathe bit. I made this tungsten carbide-tipped lathe bit myself, practically from scratch. Seriously, I used an acetylene torch and a graphite mold to sinter together tungsten carbide and cobalt powder (cobalt is the binder that holds together the very hard particles of tungsten carbide). Then I ground and sharpened the resulting pellet on a diamond wheel and silver soldered it to a steel shank (I was fortunate to run into an employee at my favorite welding company who knew exactly the right type of brazing material and flux to use). It actually works, though in practice it is of course much easier, and cheaper, to buy commercially produced bits (see the neighboring sample for and example of such a commercial bit). 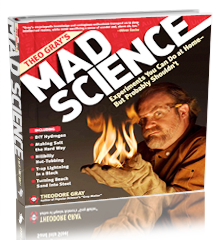 You can read more about this bit and see it in action in my Popular Science column on the topic. Larger | Spin | 3D Commercial tungsten carbide lathe bit. This is a small tungsten carbide lathe bit. Most of the bit is steel, only the triangular chip at the end is tungsten carbide. Larger | Spin | 3D Unusual tungsten carbide drill bit. This is a very pretty, and unusual, tungsten carbide drill bit meant for drilling ceramic tile. Most such bits have a single spear-point-shaped piece of carbide brazed to a steel shank. This bit has four pieces brazed together to form a square. Presumably it cuts more smoothly and gives a rounder hole, though I can't say I've actually tried using one like this. It's too pretty for that. Larger | Spin | 3D Bottle of spheres. These are a few pellets from a 10-pound bottle I got on eBay. A 10-pound bottle of tungsten pellets is not very big! I'm not sure what they were made for, probably to be dead weight in something, possibly as shotgun shot. Larger | Spin | 3D Evaporation basket. This is a resistive heating element coiled into the shape of a basket. It was used to evaporate gold in a vacuum vapor deposition machine: The gold color is left over gold. Tungsten is a good material for making evaporation baskets for the same reason it's good for making light bulb filaments: It maintains its strength at very high temperatures. Larger | Spin | 3D Lit tungsten filament 2. This is an ordinary low-wattage tungsten filament incandescent bulb, with power applied. My assistant Nick Mann though of this sample and photographed it on our rotation turntable: Click the Spin link to see it rotating. Larger | Spin | 3D Lit tungsten filament. Larger | Spin | 3D Tungsten carbide ring. Ed Pegg found a great source in China that makes and sells tungsten carbide rings, including custom-made shapes, for ridiculously low prices. Larger | Spin | 3D Evaporation boat. This strip of metal has a depression in it meant to hold a sample of some material to be analyzed. Called a "boat", it is made of tungsten to resist the high temperature of the furnace used to evaporate the material it's holding. Larger | Spin | 3D Tungsten carbide inserts. The Boeing aircraft company operates a wonderful surplus store in Kent, Washington (near Seattle). These are solid tungsten carbide cutting inserts: They each fit a particular milling bit, where they are clamped or screwed into place. When they wear out, they can be replaced, allowing the body of the bit to be used indefinitely. Larger | Spin | 3D Ugly partially melted cluster. This was made by Ethan for no particular reason: It's a small batch of tungsten cylinders partially melted into a cluster using an arc welder of some sort. If you have to ask why, well, join the crowd. Larger | Spin | 3D Tungsten carbide cutting wheel. The Boeing aircraft company operates a wonderful surplus store in Kent, Washington (near Seattle). These three slot cutting bits (6-8 inches in diameter) are not saw blades, they are used in horizontal milling machines to cut grooves in metal, similarly to the way a dado blade works in a table saw, but more expensive. The one standing up in front is the fanciest, each tooth is an individual block of tungsten carbide, used for cutting very hard or abrasive metals. This one would stay sharp for a very long time cutting aluminum, or a decent interval cutting titanium or steel. The other two were kind of a mistake, I meant to buy only carbide-tipped ones, as tungsten samples, but they were coated in protective wax and I didn't look closely enough. The fact that they were in wax, which is how they are generally sold when brand new, is somewhat odd since they were being sold at scrap prices (a few dollars per inch of diameter). Perhaps the Boeing company is so organized that when they put used bits into storage they re-coat them with protective wax. Larger | Spin | 3D Tungsten Pig. This is a storage container, known as a pig, intended for safely holding highly radioactive isotopes used in the medical field for treatment and diagnosis. It's made of tungsten, which is somewhat unusual for a shield, lead and depleted uranium being more common shielding materials. But it makes sense, all these metals are good shields mainly because they are very dense, which is another way of saying lots of atomic nuclei packed into a small space, the better to block fast-moving decay products. The person I got this pig from has many more like it, as well as other kinds of lead and tungsten shielding products. He doesn't want to be identified publicly, but contact me if you'd like to buy similar objects from him and I can put you in contact. Click the Source link below to see other kinds of things he has available. Larger | Spin | 3D Bullet blank. This small (1/4" diameter) rod is from a munitions factory and was meant to be machined into a bullet shape. Tungsten is used for very fancy bullets because it's hard and dense, allowing it to carry a lot of energy to the target. Larger | Spin | 3D Tungsten turnings. Larger | Spin | 3D Zone-refined single crystal. This is the rest of the bar from which the sample three above was cut. It has a combination of the natural molten surface and a more regular surface where it was partially turned on a lathe. Larger | Spin | 3D Tungsten-weighted dart. People who play darts care about exactly how much their darts weigh, and how that weight is distributed along the shaft of the dart. They also care about air resistance. Tungsten is a natural choice of material to make the body of the dart out of, because it's very dense. This allow you to put a lot of weight exactly where you want it without introducing a lot of extra air resistance. Or you could get a life. Larger | Spin | 3D Huge light bulb. This bulb looks like a grotesquely overgrown projector bulb or headlamp. The envelope of glass, while as big as an ordinary household bulb, is small compared to the size of the filament, which makes me think it's almost certainly fused quartz designed to operate at very high temperatures. When a tungsten filament is glowing white-hot, a small amount of tungsten slowly boils off the surface of the filament and condenses on the inside of the glass envelope of the bulb. This causes two problems, first the filament eventually gets too thin and fails, and second the bulb slowly darkens due to the tungsten film being deposited on the glass. Bulbs like this reduce this problem by putting the glass very close to the filament, and using gases with relatively high thermal conductivity inside, resulting in a very, very hot glass surface that tends to re-evaporate any tungsten that lands on it. Thus the bulb doesn't darken, and some of the tungsten that evaporates off the filament ends up condensing back on it. This re-condensation means that, at a given operating temperature, the filament will last longer. Alternately, it means you can get the same life while operating the filament at a higher temperature. The higher the temperature the more efficient the bulb, and the whiter the light. At 2000W this is a big bulb, but I'm not sure what it was used for, or whether it's still in common use. Many high-power applications like projectors and search lights now use xenon arc lights, which are much more efficient. This is a remarkable object: A bar of pure tungsten that has been zone refined into a single monolithic crystal. As a single crystal, its density should be almost exactly equal to the theoretical maximum density of tungsten, which is not easy to achieve. The bar was created in a large vacuum electron beam furnace by carefully moving a molten zone from one end of the bar to the other, allowing the material to cool at a rate that allows it to align itself to a single, consistent crystal axis from one end of the bar to the other. Zone refining also tends to chase impurities to the end of the bar, resulting in higher purity over the rest of it: To what extent this effect has been utilized to purify this bar I don't know, nor do know the exact purity, but it must be quite high to achieve single-crystal status. Exactly how zone refining is done in tungsten I don't know, but I'd sure like to see it done some day. This piece is only about an inch long, but I've got another five inches of it that I plan to get polished and beautified one of these days. No, it's not for sale. Larger | Spin | 3D Powder. Look, let's be honest here. A photograph of a pile of powder just doesn't do it for me, OK? I mean, the powder is very impressive in person: Being tungsten it is of course remarkably heavy, and that's something I just love no matter how many times I pick it up. But you can't tell that from the photograph, or even from the 3D rotation video (click the turntable icon). So if you want to know what this is all about, you're just going to have to get some tungsten of your own, powder or solid, either way it's just about the neatest stuff around. Just not photographically. Larger | Spin | 3D Museum-grade sample. This cylinder is made of solid tungsten, but plated with gold so it looks like solid gold. And unlike most fake gold, it actually weighs the right amount. Interestingly, the density of tungsten is virtually the same (to three decimal places) as the density of gold, so if you want to make fake bars of gold, using tungsten in the core would be a really good idea. Getting the weight right is important because gold, like tungsten, is extremely dense, nearly twice the density of lead. No one who knows their gold would be fooled by anything crude like gold plated lead. Remember those old Westerns where the bad guys sling a bag full of gold bars over their saddles and ride off? Forget it: The horse would never make it, those bars are a lot heavier than they look. Larger | Spin | 3D Solid tungsten coin. Made by the same people as the pen above, this is basically an advertising token for the Inkling Pen company. Note that it is not by any means a free advertising token. As with anything made of tungsten, you can't mistake it for anything ordinary the moment you pick it up. It also has an amazing ability to spin and rattle for a really long time as it settles down. Would anyone pay $180 for an advertising token? I don't know, but for what it's worth, I bought two of them, one for me and one as a gift for Oliver Sacks. Larger | Spin | 3D Solid tungsten pen. This is serial number 2 in a very limited production run of these pens. Expensive, but really, really heavy. Larger | Spin | 3D W.
No, it isn't some kind of political statement, it's the symbol for tungsten cut out of, naturally, tungsten. This was done with Kaistar R&D's lovely water jet cutter. No idea what these were used for, other than a wild guess that maybe they were wire pulling dies. Very heavy. Larger Westinghouse 1500W aviation bulb. I'm a sucker for a big light bulb. I'm not sure exactly what function in aviation this bulb had, but it's 120V so I'm guessing runways rather than airplanes, as they don't typically have 120V wiring so far as I know. If you've got a Tungsten spark plug like I do (see above), how can you resist a genuine Tungsten wrench to go with it? If you have an element collection, like I do, you should also be sure to mention that neither the wrench nor the spark plug has any tungsten in it: Tungsten is just a brand name. This is what you get when you wait too long before writing up a sample. I can't for the life of me remember where this bar came from. So, if you sold or gave me this bar, please remind me! Environmental concerns have prompted a switch from lead to other metals for fishing sinkers. Click the sample group link below to see what metals have been used. Water jet cutters are crazy. It's an insane idea that obviously can't work, both because it's plainly impossible to compress water to 42,000psi and shoot it out a nozzle, and because even if you could, what on earth would make anything think you could cut metal with it? Well, actually, it turns out neither of these things is impossible, just expensive. This is a solid tungsten-carbide nozzle for a machine that can cut inch-thick metal (any metal, doesn't much matter) using the aforementioned 42,000psi water jet (laced with garnet abrasive). It has a computer-controlled arm that lets it quickly and accurately cut out any shape you can design with its built-in CAD system: Soon I hope to have an example of its work listed as a titanium sample. Larger | Spin | 3D E-beam furnace cathode. Larger | 3D Single-crystal button, melted. This button started out as a single crystal of tungsten (see previous sample) and was then melted on both sides to make it round and shiny. Because the core was never melted, the molten sections almost certainly recrystallized in alignment with the core, meaning that this button is still a single near-perfect crystal of tungsten. See the samples above for more examples of tungsten buttons and information about the company that produces them, or click the Source link below to find out how to get one yourself. I wrote a story about the visit where I received this object. Larger | Spin | 3D Single-crystal button. It's a part of a modular Tungsten-Titanium target that was made like a honeycomb. Titanium played the role of wax and tungsten monocrystals the role of the honey. The incline indicates direction of evaporation: thinner end to center thicker end to edge. Larger | Spin | 3D High purity button, broken. This button of tungsten started out as tungsten powder, and was then partially molten from the outside before being broken in half. It demonstrates very nicely the difference between the sintered structure in the middle, which is around 96% of theoretical density, and the true crystal structure of tungsten in the fully molten outside, which is at 99+% of theoretical density. I highly recommend the 3D view of this sample (click the camera/turntable icon above), which allows you to see clearly how the crystals growing from the inside form a pattern of facets on the surface. The furnace that made this button was fully capable of melting it all the way through (which says a lot about the furnace, as that is no mean trick for tungsten, the highest-melting element of all). The electron beam was throttled back to only about 20,000 volts to limit the depth of penetration, intentionally preserving the sintered structure in the middle. See the sample above for more about the company that made this button. Larger | Spin | 3D High purity button. This very high purity button was produced by Kaistar R&D (see Source link below if you want one) in their vacuum electron beam furnace, which Oliver Sacks and I visited in the summer of 2004. I wrote a story about the visit, which includes photographs of the incredible furnace used to produce this button and the many others they offer on eBay and direct to the element collecting hobby. I think it's safe to say that you will not find more perfect samples of transition metals anywhere. This sort of button is hard to appreciate in a photograph: It's the great smoothness and density that make them so satisfying to hold. See the next sample for a more visually interesting variation. These are very small, but of course surprisingly heavy, beads meant to be used in fly-fishing as sinkers. Larger | 3D Molten welding rod. This is a button of pure tungsten metal melted in an arc furnace I built out of a few fire bricks I got at an auction, a couple of graphite rods from a welding shop, and an old stick welder ("buzz box") I inherited from the former owner of my farm, the infamous Larry. It's surprisingly easy to build such a furnace and use it to melt the highest melting point element in the world, tungsten. You can read more about this process in my article in the May issue of Popular Science magazine. Larger | Spin | 3D 1/2" rods. These are tungsten rods left over from experiments Kevin Anetsberger of the Midwest Tungsten Service did to see how best to thread the ends. From the look of it, it's not easy. He brought them when he came for a visit to help me with my attempts at vacuum vapor deposition, which were not going well. Larger Sheet for x-ray tubes. "Pure" tungsten sheet, a popular seller on ebay, these are from a major SNAFU at a factory where they were making x-ray tube targets. In a nutshell x-ray tube tungsten must be processed by vacuum sintering and hot rolled into an essentially solid sheet for reasonable life, this material was hydrogen sintered and in as pressed condition, OOPS! Anyway to make a long story short they didn't know until they tried the burn-in and almost all the tubes failed. Many, MANY thousands of dollars of tungsten, work, and anode assemblies were wasted all because someone decided to buy the WRONG material because it was cheaper. Larger | 3D Wire extrusion die. Wire, even hard steel wire, is generally made by forcing solid metal through a hole, called a die, under such intense pressure that it is extruded like pasta. Can you imagine the incredible forces that must be acting on the holes? In some cases diamond or sapphire (nearly as hard) dies are used, but this one is made of a tungsten-cobalt alloy, probably because of its high strength even at very high temperatures. The source reports that this one was showing signs of failure and was therefor removed from service. Larger | Spin | 3D Antique tungsten-filament lamp. This bulb is displayed in my Bulb Stand along with many other examples of light bulbs. Larger Tungsten core golf balls. Golf balls? Tungsten? Lord knows what makes anyone think this would help them, but I guess if you're bad enough at the game, you'll buy anything. I don't know if these actually have any tungsten in them: I sure can't find any. It's possible there is a trivial amount of tungsten powder scattered in the rubber core. It's on my list of things to test next time I visit the XRF machine. Larger | 3D Sample from Wooden Book. This sample is one of the cylinders that we plan to include in the product: It's incredibly heavy for its size, and quite remarkable when compared with the magnesium cylinder in the set. Larger | Spin | 3D 25mm APDS-T projectiles for 25mm Oerlikon KBB gun. High velocity discarding sabot projectiles for the 25mm Oerlikon KBB gun. They are black plastic with a black cap. Upon firing, the sabot breaks off into 3 segments, and the low drag core carries on at high velocity. Core is tungsten carbide, with a zirconium tip. Very impressive pyrotechnic display upon impact! White hot displaced metal arcs out in an umbrella pattern. In subsequent communications with the source, it appears that there are several variations that are not always easy to tell apart (it's hard to cut the plastic away to see what's inside, and of course that ruins the round). The one I got is tungsten metal (not tungsten carbide), and the tip is zinc alloy, basically a windshield that makes the shape more aerodynamic while permitting the tungsten core to have the optimal penetrating shape. (Analysis by x-ray fluorescence spectroscopy at the Center for Microanalysis of Materials, University of Illinois, partially supported by the U.S. Department of Energy under grant DEFG02-91-ER45439). Larger Sample from the Everest Set. Larger Sample from the RGB Set. Larger | 3D Tungsten/zirconium alloy screw plug. Neil Lipson, the source of most of my tungsten and molybdenum, sent me this little plug in exchange for me analyzing what it's made of. He was hoping there might be iridium in it, but instead analysis by x-ray fluorescence spectroscopy at the Center for Microanalysis of Materials, University of Illinois (partially supported by the U.S. Department of Energy under grant DEFG02-91-ER45439) indicates that it's a strange mixture of primarily tungsten (62%) and zirconium (30%), with the remainder being iron and nickel. I looked around on the web and could find no references to tungsten-zirconium alloy, but that's no proof that such a thing isn't used in specialized applications. I would guess high temperature, corrosive environments, perhaps a chemical reaction chamber that operates at high pressures and temperatures. By the way, the tungsten alloy three-hole spanner threaded plug on your site is a weight plug for the Callaway Hawk Eye golf club. A chamber in the club head is filled with a measured weight of the aforementioned pellets, then closed with the plug, which is machine-driven with a three-pin spanner drive head. The Big Bertha plug is similar, but has larger diameter, smaller spanner holes spaced further apart, and the head contour comes up as a shallow cone, which then goes to a flat, rather than the blended contour of the Hawk Eye plug. Shows what I know, eh? Larger | Spin | 3D Tungsten spark plug. Or at least, a spark plug made by a company called Tungsten. I don't really know if there is any tungsten in any part of these spark plugs, but I'll eventually test them and report what I find. The most interesting thing about this sample is that not just one but two people would be willing to pay a minimum of $40 for a single rusty old spark plug (it takes two people to drive the price of an auction up). I'm not sure why I was willing to bid that high, and I certainly have no idea why the other idiot was, but isn't it wonderful that eBay exists to allow the exchange of a million people's junk into a million other people's treasure! Here's an interesting article about different elements in spark plugs. Larger | Spin | 3D Cubes, 99.99%. These are just rough cubical chunks, quite small, of quite high-purity tungsten. Nice and heavy as usual. Pointy too. Larger | Spin | 3D Fine wire. This is really, really fine tungsten wire: 0.0025 inches diameter. It's quite strong, but what's really surprising as usual is how heavy the spool is. I need to figure out something to do with it, like hang a picture, because I've got 5000 feet of it. Rods of solid tungsten from 1/16 to 1/8 inch diameter and 3-7 inches long are used as electrodes in certain kinds of arc welding. Claudin Welding Supply kindly donated one when I went there looking for Hafnium. Larger | Sound Bar of 99.99% tungsten. Ivan Petrov (see above cylinder sample discussion) kindly donated a couple of very pure metal samples, including this lovely machined bar of "four nines" tungsten. It looks like powder metallurgy origin to me, but he didn't know for sure. When NPR's Science Friday program asked to interview me about the Periodic Table Table, I decided to record "the sound of sintered tungsten", as mentioned in Uncle Tungsten. Oliver Sacks has actually listened to this recording and confirms that it's the kind of sound his uncle was talking about. (Wow, how authentic can you get!) Click the speaker icon to hear the sound of tapping this bar with a mallet. Larger | 3D Surplus 11 pound metal cylinder. Purchased from Neil Lipson (Lipson@postoffice.att.net) after contact through eBay. Said to originate from a company closure. This is by far the most tactile sample in the collection: People just can't put it down, because it's so darn heavy. I always point out that it's almost exactly the same density as gold, so holding this lump is as close as you're likely to come to the experience of holding about $50,000 (at $350/troy ounce) worth of gold. I had a suspicion that it was probably not pure tungsten. Research on the internet indicated it was probably about 97% tungsten, 1% iron and 2% nickel. The iron and nickel are mixed with tungsten powder and the mixture heated under great pressure to fuse the iron-nickel alloy into a matrix around the tungsten particles. Larger | Spin | 3D Wolframite. Larger | Spin | 3D Photo Card Deck of the Elements. Larger | Spin | 3D Scheelite from Jensan Set. This sample represents tungsten in the "The Grand Tour of the Periodic Table" mineral collection from Jensan Scientifics. 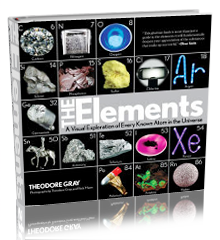 Visit my page about element collecting for a general description, or see photographs of all the samples from the set in a periodic table layout or with bigger pictures in numerical order. Larger | Spin | 3D Huebnerite. Huebnerite (Mn+2 WO4 mon. ), Huayllapon Mine, Pasto Bueno, Ancash, Peru. Very nice biterminated crystal, black reddish, with Quartz, high lustre. 6,5x3,5x1,8 cm; 82 g.
Larger | Spin | 3D Scheelite. Scheelite (Ca WO4 tet. ), Volchiy Mine, Chukotka Okrug, Russia. Very nice little example, with Scheelite octahedral crystals and black Cassiterite. 2x1,5x1,6 cm; 15 g.
See above for a description of zone refining. I actually had this bar in my hands for a few weeks, but I had to send it on to Ethan as part of a complex element trading scheme. Fortunately not long after that I got some of my own, which is described more fully above. This is the bar of tungsten sent to Oliver Sacks by Roald Hoffman which triggered Sacks' memories of his uncle, which led to his writing Uncle Tungsten, the reading of which lead me to make the Periodic Table Table. Sacks carries this bar with him everywhere, and when he came to visit the Periodic Table Table on November 12, 2002, I photographed it, so now it's an external sample in the table it created. Now I just need to find and photograph whatever it was that triggered Roald Hoffman to send Sacks the bar in the first place. Eventually I should be able to trace this thing back to the big bang.